There’s no doubt about the fact that making a website has become a lot more comfortable with WordPress. Even everyday users with no prior coding experience can build a WordPress site within a day or two. However, this doesn’t mean that it’s a walk in the park—nothing is. Sometimes, the admins of WordPress sites might run into errors. ‘ERR_TOO_MANY_REDIRECTS’ or‘This webpage has a redirect loop problem’is one such error. In Google Chrome, you see the ERR_TOO_MANY_REDIRECTS error. In Firefox, this error is shown as ‘The page isn’t redirecting properly.’ And in Microsoft Edge, you’ll encounter‘Hmmm… can’t reach this page’ error. No matter what the message says, it means pretty much the same. This is a relatively commonly encountered error that can be fixed quickly. So, stop scratching your head right now! Why do I see ERR_TOO_MANY_REDIRECTS error on WordPress? 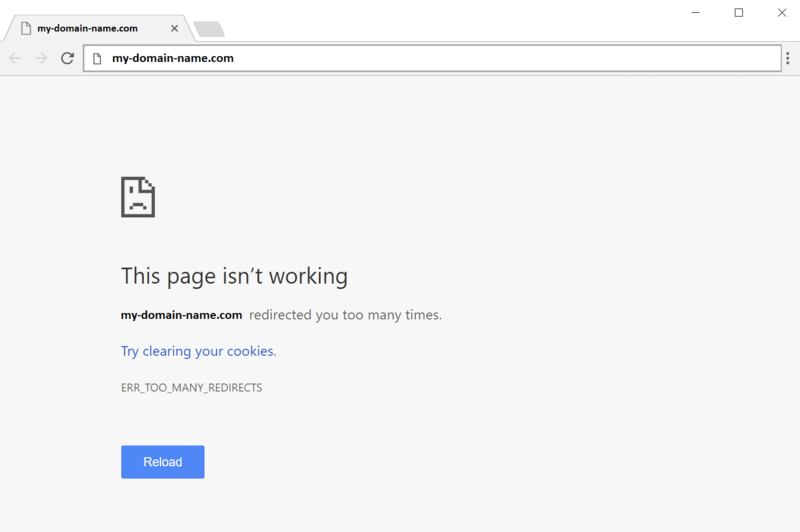 The ERR_TOO_MANY_REDIRECTS is precisely what it seems—it’s redirecting your WordPress site way too many times—into an infinite loop as some call it. Your website is very likely to be directing continuously between two URLs. With one pointing to another, the second pointing to the original…this could go on infinitely—unless you do something. Most of the times, plugins turn our to be the culprits. Here, we’ve enlisted various methods by which you can fix the ERR_TOO_MANY_REDIRECTS in WordPress. If one doesn’t work, try the next one. Sooner or later, the ERR_TOO_MANY_REDIRECTS error will be corrected. The most common culprit behind ERR_TOO_MANY_REDIRECTS is a plugin. If you use too many plugins, it might become hard to find the one causing the error. So, disable all of them at once! Yes, all of them. Once done, check if the error persists. If it doesn’t, one of the plugins is responsible. Now enable all plugins and disable one or two plugins at a time to eliminate the non-guilty ones. This is how you get to the real culprit. Here’s the step-by-step process to disabling plugins. First, go to the File Manager by accessing your hosting control panel. Now find the wp-content folder and locate the Plugins folder. Now select the Plugins folder and click on the Rename option. Rename the file to anything but Plugins. This won’t do any damage as you can rename the folder whenever you want to. Press the Save icon to save the changes you just made. Once renamed, visit your website to check if the error persists. If it’s gone, one or more plugins are causing the error. To remove the error on a permanent basis, you’ll have to find and remove those bad plugins. To remove plugins,go to your FTP/File Manager by going to wp-content/plugins folder and then delete the plugins one-by-one. In between, keep checking the website for error. Once you find the responsible plugin, remove it/them and rename the Plugin folder back to Plugins. Hope this has solved the ERR_TOO_MANY_REDIRECTS. If it hasn’t, try the next solution. If you’re not able to access the admin panel, you can remove the plugin through the FTP program. First, open your FTP program and connect to your WordPress root folder. Now find the folder listed as “wp-content/plugins/. Locate the plugin’s folder and delete it. Delete the plugin in folder. Now check if WordPress Address (URL) and Site Address (URL) have the correct information. Save the settings and see if the error is still there. If this solution hasn’t fixed the ERR_TOO_MANY_REDIRECTS, try the next one. The .htaccess file might be another thing causing trouble. To resolve it, you must disable the .htaccess file. First, go to the File Manager via your hosting control panel. Now select the .htaccess file, right-click it and click on Rename. As we all know, HTTPS is almost mandatory these days. Knowing that you might have migrated your site to HTTPS but could’ve made a few mistakes along the way. Many people force their sites to HTTPS without installing an SSL certificate. This could result in infinite loop of redirects. To check if your redirections are misdirected or not, you can use 3rd party redirection mapping tools available online. ERR_TOO_MANY_REDIRECTScould be the result of a third-party service that you’re using on your WordPress website. For example, Cloudflare. If you’re using Cloudflare, you might have set the SSL option as Flexible. If your hosting server directs to HTTPS and Cloudflare directs to HTTP, it results in redirection loop. If you’re using Cloudflare and have set the crypto settings as Flexible, set it as Full or Full (strict). The ERR_TOO_MANY_REDIRECTS is a pretty common error and you don’t need to worry about it as it’s not that big of a deal. However, there is no room for complacency as you’re losing out on viewers and it’s not leaving a good impression in their mind. So, fixing the error ASAP is what you should be aiming at. We hope our solutions have helped you get fix the ERR_TOO_MANY_REDIRECTS error. Jake has an astounding affinity for learning & writing about technology. Day after day, he continues to be fascinated by the constantly evolving world of cybersecurity & encryption. And he keeps updating the world in form of his blogs.